The Half Pipe Rampage Slide is a slide that will give you the most adrenaline rush you can imagine with it's uniquely steep slide. The Halpf Pipe Rampage Slide is most ideal for ages 12 and up due to its steep climb and slide. Try the Rampage giant slide today and see how much fun you can have with this steep slide which finishes off with a unique slope at the end. 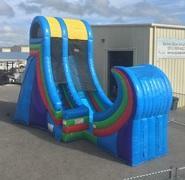 This is a giant water slide that will bring tons of fun for any event!